This variation of the floor reaction AFO offers exceptional triplanar control with less surface contact than other designs, making it lighter weight and cooler. 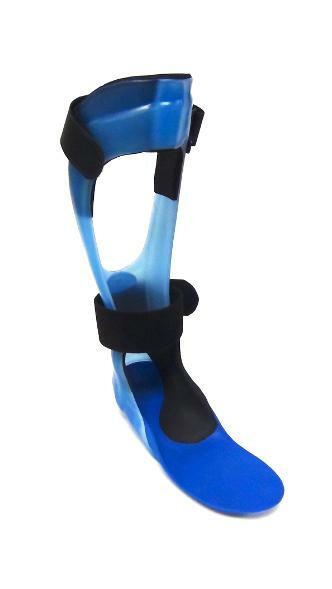 The secret is a polypropylene reinforcing strut that runs the length of the AFO from the medial arch up the leg, then back down to the lateral border of the heel. This offers significant rigidity for triplanar control. 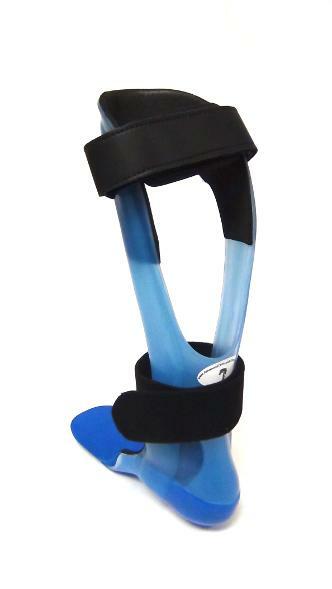 This is armor for the ankle. This is by far the most popular design we make for the adult population and the outcomes are better than with any other design we fabricate. The anterior shell captures the tibia better than posterior designs. We feel this helps to control tibial rotation. Medial and lateral trimlines extend anterior to midline at the ankle. A long lateral forefoot trim limits forefoot abduction, when indicated, and a well molded, padded footplate comfortably controls foot motion. The Texas TURBO is indicated in most situations where a standard floor reaction or solid AFO is indicated- including all diagnoses that require triplanar control. Some very applicable diagnoses are: Posterior Tibial Tendon Dysfunction, chronic Achilles Tendinitis, Osteoarthritis, Chronic, acute Plantar Fasciitis, and more. This design is comparable to rigid carbon fiber AFOs on the market, but posesses the adjustability and price point that comes with polypropylene. This low profile design limits motion in the foot/ankle complex. I am writing to tell you how wonderful you are! If you hadn't posted the Turbo AFO videos on Youtube, I would not be experiencing the fantastic feeling I have when walking now. When I saw the video, I was really in a quandary about what to do. I have CMT and have worn braces for 20 years. Most of that time in the traditional AFOs and then more recently in the carbon fiber toe-offs. These just didn't work for me because I had very little support and they actually made me turn my foot inward which caused stone bruises on my heels. I was going back to my orthotist to get fitted for the traditional AFOs again. I started researching online and was very interested in Marmaduke's braces. I called him and he was a wonderful resource and really gave me hope that there was something out there that could really help me. But, of course, they are extremely expensive and insurance help is iffy. So I kept looking, and then I saw your video. I immediately thought this might be it for me. I talked to my orthotist, Jake Bentley in Hiram, GA, who watched the videos then called and talked to you. Long story short. . . he made the braces and I have truly not walked this well in 30 years! I really feel that propulsion forward, and I have the feeling of walking on a cloud. My gait is better than ever (almost normal if I dare say). I am a member of the CMT Atlanta Support Group, and I am so excited to show off my new Turbo braces at our next meeting. I know many members will be interested in this new design that has truly changed my life. I have my confidence back, and I'm not struggling to keep my balance with every step. Thank you so much for sharing your knowledge. It means the world to me. Part 1 of a Texas Turbo Triplanar Control AFO fitting. Part 2 of a Texas Turbo Triplanar Control AFO fitting. An overview of the entire fabrication process for a Texas Turbo Triplanar Control AFO. The process of pulling plastic over struts for a Texas Turbo Triplanar Control AFO.